Prepare this Skillet Chicken Breasts in Mushroom Sauce recipe in 30 minutes. 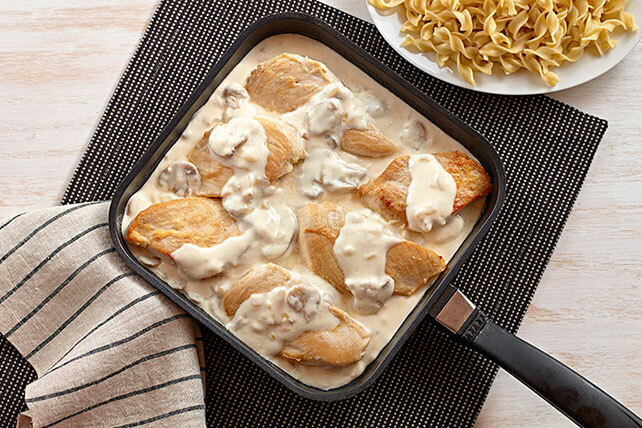 Our Skillet Chicken Breasts in Mushroom Sauce is a perfect quick-fix dish. Heat 1 Tbsp. oil in skillet on medium heat. Add chicken; cook 6 to 7 min. on each side or until done (165ºF). Transfer to platter; cover to keep warm. Add remaining oil and onions to skillet; cook and stir 3 to 5 min. or until onions are crisp-tender. Add mushrooms; cook and stir 2 min. Mix remaining ingredients until blended. Add to skillet; cook on low heat 3 to 5 min. or until heated through, stirring frequently. Pour over chicken. Serve with a bagged green salad tossed with your favorite KRAFT Dressing, such as Italian or Ranch.